Here at House of James, we are fortunate enough to be able to host many different events. We often have music in our coffeehouse (in fact Jacob Moon is going to be here again on Friday, June 28), we have authors like Bryan Davis come and visit us (encouraging our youth to read and pursue writing dreams), we have new authors like Trudy Beyak come in for book launches (her book is quite amazing, you should read it and find out for yourself), we have occasional workshops and we have breakfast meetings (with hot yummy breakfasts baked fresh in our coffeehouse)…we are blessed to be able to serve in a variety of areas and we love it! Last week we had Rick Goossen visit and talk about his new book, Entrepreneurial Leadership, which he co-authored with R. Paul Stevens. It was quite a morning as many of our community business men and women arrived early for a freshly made breakfast served with plenty of coffee. Upon walking into the store, there was a buzz around the room as people talked, connected and shared…it made me smile as I marveled at the group that had come together. 'I found this to be a really important book that helped me understand my role as a Christian entrepreneur. Full of thoughtful and well researched content that validated how I often feel as a business leader. 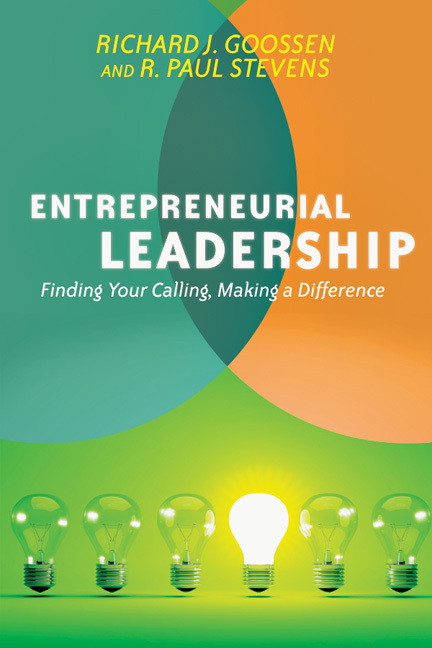 Paul Stevens and Rick Goossen have taken ideas from Peter Drucker, John Maxwell, the Bible and many entrepreneurial interviews to bring us clarity and and a strong foundation in understanding these leadership roles. They source Stephen Spinelli and Jeffry Timmons who say there are six dominant themes that have emerged from what successful entrepreneurs do and how they perform: Commitment and determination; leadership; opportunity obsession, tolerance of risk, tolerance of ambiguity and uncertainty; creativity, self-reliance and adaptability; and motivation to excel.